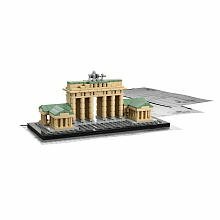 b Build a LEGO replica of the Brandenburg Gate! The grandest of a series of 18 gates through which the city was accessed, the Brandenburg Gate was constructed between 1788 and 1791 from the designs of architect Carl Gotthard Langhans and was inspired by the Propylaea in Athens. 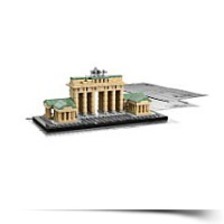 Architectural replica with all the realworld Brandenburg Gate Booklet included with facts on design and history. /b Commissioned by King Frederick William II of Prussia as a sign of peace, the Brandenburg Gate is 1 of Berlins most substantial monuments both as an architectural landmark and historic symbol for more than 200 years. Built in sandstone and comprised of 12 Doric columns, the gates crown jewel will be the Quadriga, a sculpture of a chariot and 4 horses depicting Victoria, the Roman goddess of victory, developed by Johann Gottfried Schadow. This detailed LEGO model was designed by architect Adam Reed Tucker. Dimensions: Height: 2.4" Length: 10.2" Width: 7.4"
Package Dim. : Height: 2.5" Length: 10.3" Depth: 7.6"